Jeremy Corbyn will set out Labour’s vision for an industrial renaissance today and argue the Tories have failed the British manufacturing industry. Launching Build it in Britain, a new campaign to boost post-Brexit manufacturing, the Labour leader will link the government’s handling of EU negotiations – specifically “Conservative customs chaos” – with the decline of UK industries. He will say that manufacturers have been “sold out” as Theresa May hasn’t allowed British exporters to benefit from the weak pound. Addressing the manufacturers’ organisation EEF in Birmingham, Corbyn aims to woo Leave voters and ‘the left behind’ more broadly. The proud rhetoric and policy focus on industrial workers shows efforts to shed Labour’s north London champagne socialist image and get back to speaking truth to power on behalf of the working classes. To a large extent, Brexiteers in the Conservative Party have successfully framed whether to leave the EU as a choice between European protectionism (boring, status quo, “more peas dear?”) and free trade (new, exciting, dynamic). But it doesn’t have to be this way, Corbyn is saying. He slams the “fantasy of a free trading buccaneering future” as “a nightmare of chlorinated chicken… and our country in hock to Donald Trump”. 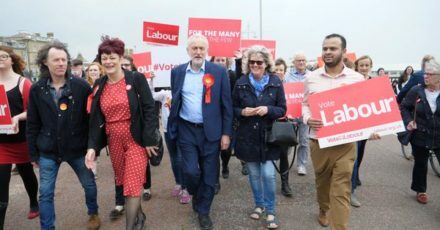 Instead of desperately trying to make an ally of the unpopular and unpredictable US President, Labour is promoting a patriotic socialist post-Brexit vision whereby outsourcing is rejected and public contracts are kept in the UK. Controversially, although the Labour leader extols the virtues of a new UK-EU customs union, he does highlight Brexit positives. Well, one in particular. “Our exporters should be able to take proper advantage of the one benefit to them that Brexit has already brought – a more competitive pound,” he will say, as he argues “our economy far too reliant on imports”. This approach is divisive within the Labour Party. Already, members are complaining that Corbyn is being too optimistic about Brexit, and some have even claimed he is engaging in anti-immigrant rhetoric. “What next? A mug?” tweeted David Schneider. But Corbynites of the more Lexiteer persuasion have been airing the arguments being put forward by the leader today for some time. Brexit will offer the chance to shun neoliberal globalisation and restructure our economy, activists and commentators of the left such as Grace Blakeley say, moving it away from hollow financial services and towards real sustainable growth rooted in the UK. The Labour leader’s latest Brexit analysis further highlights the differences between the pro-Corbyn left and the pro-Corbyn, pro-EU left. Today the house rises and parliamentary recess starts, so this is the last LabourList morning email before MPs return in September. That is unless, of course, Corbynsceptics attempt a coup or Tory rebels send in 48 letters of no confidence – then I suppose I’ll have to reboot this thing. We’re not shutting down over the summer: I hope to send out the odd survey, and the site will be active as ever, so keep tweeting, pitching and visiting labourlist.org for the latest news and comment.